Halifax School for the Blind. I’m travelling vicariously through my books, and I’m really getting around. These beautiful photos are compliments of Scott Haggerty who recently travelled to Germany and France with my books tucked close to his heart. How’s that for a devoted fan? I like to think he planned his trip for the sole purpose of showing my books to the world, but alas that would be a bit presumptuous of me. Taken in La Clayette, France. Taken in Chauffailles. Scott says that both these places are about 400 km from Paris. The airport in Munich, Germany. Wow! 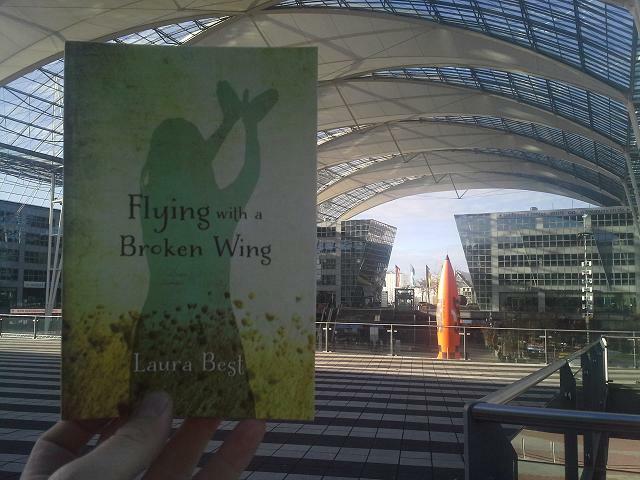 love these photos, and the thought that my book is an international traveller. And thank you Scott for sending these along. I’ll be adding them to the album on my facebook page, along with some photos of Bitter, Sweet that were taken in the same locations. Got to keep it fair, right? Wouldn’t want to show any favouritism among my books. 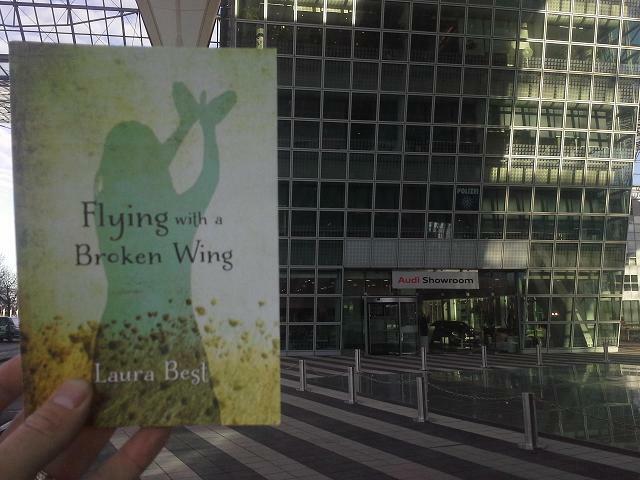 Where will my book “fly” to next? I really can’t be sure, but I’m certainly excited to find out. You all know I’m not a traveller if you’ve been following my blog for any amount of time. Interestingly enough, the same can’t be said for my books. 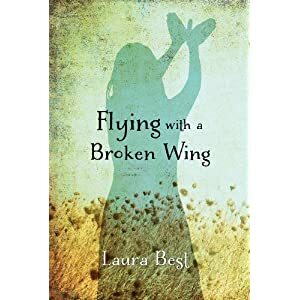 You might remember that Bitter, Sweet was off gallivanting the globe, and now, Flying With a Broken Wing is doing the same. 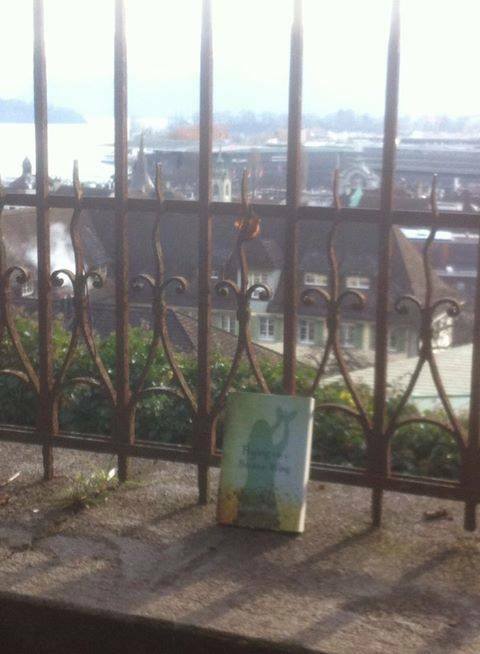 A Facebook friend recently posted these photos of my book travelling to Zurich, Switzerland. 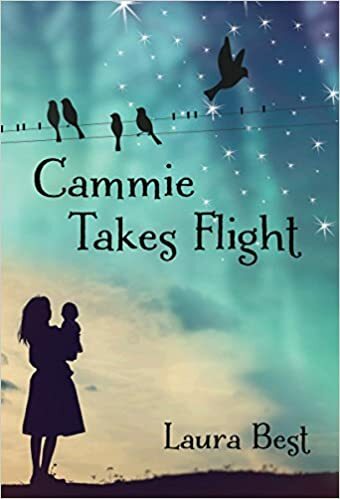 First this little book of mine went to Chicago now Switzerland. Me, I’m still in East Dalhousie! 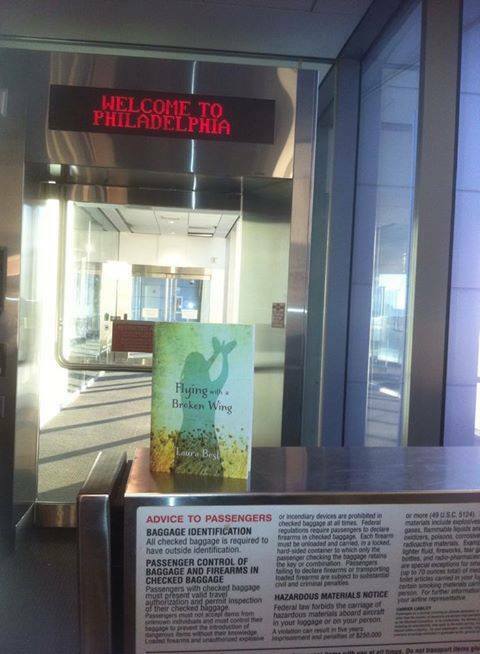 Leaving Philadelphia on Dec. 25th. 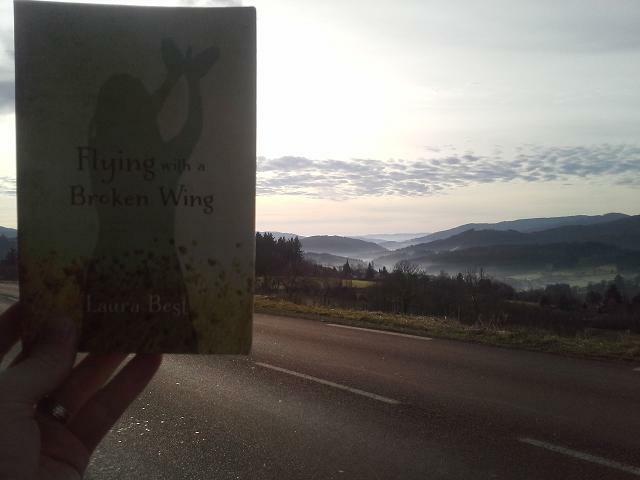 “Flying with a Broken Wing” overlooking Lake Lucerne! This final picture was posted on the last day of 2013 with this caption. 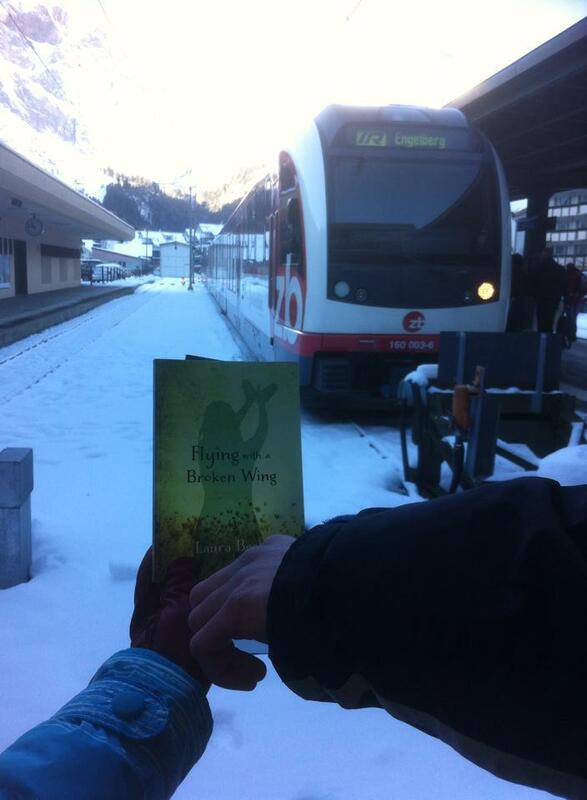 “Flying with a Broken Wing” in Engelberg, Switzerland, December 31, 2013. 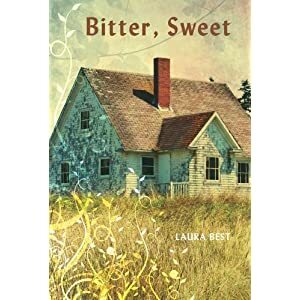 Laura’s newest book has had a great trip, and is now headed to Doha, Qatar!!!! I don’t know about you, but I think this is pretty darn cool. 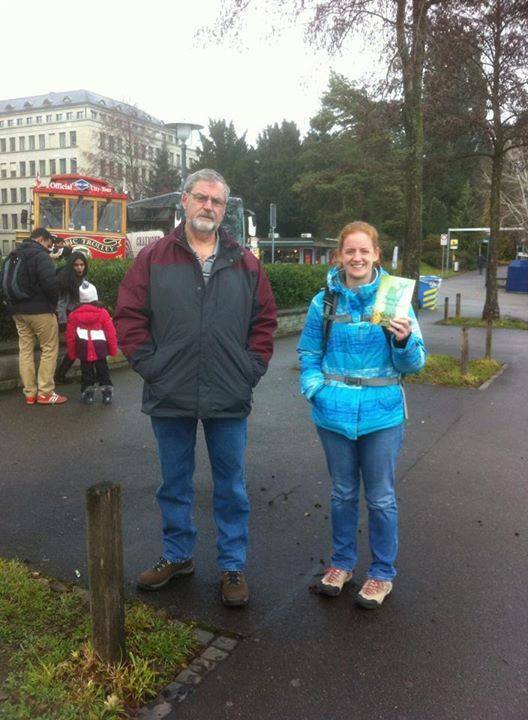 Thanks, Sarah, for taking my book to Switzerland with you! All these photos kind of gave me the idea of asking you all to join in. 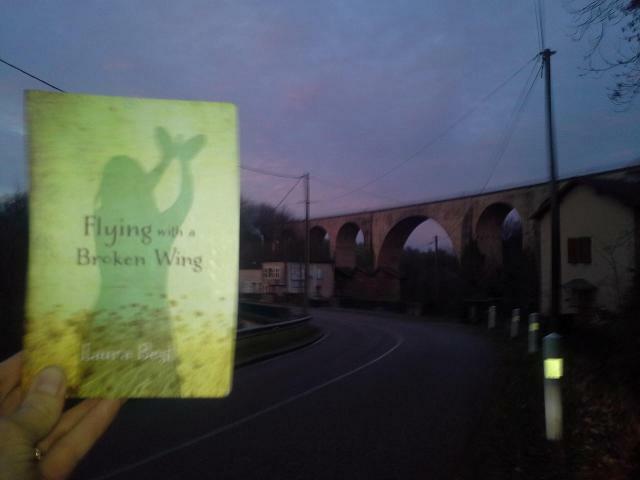 If you’d like to take a photo of my book in some location(with or without you) doesn’t have to be out of the country, or even out of the province for that matter, I’d love to post it on my blog or in my Facebook album. (Yes, I’ve created an album on my FB page just for such photos!) If you’d like to send a photo send me an email through the “Contact me” on my blog and we’ll go from there. Be creative. This could be loads of fun. 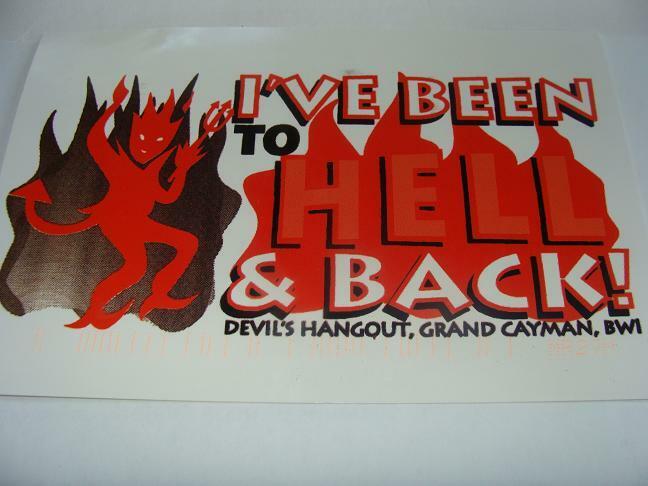 So, yesterday I got a postcard from Hell. Wow! That didn’t sound weird at all! And in case you’re wondering, nope the devil’s not out to get me. I haven’t done anything THAT bad, at least nothing that I know about. And you’d think I’d know, wouldn’t I? I know many people claim to have been to Hell and back, but how many of them actually have the proof? Oh yeah, there’s proof out there. Why not? You go to Hell nobody’s going to believe you unless you’ve got some proof. Little did I know when I opened my mailbox what was awaiting me. My sister hadn’t bothered to give me the heads up. I was totally in the dark. Oh she’d mentioned something about Hell when we spoke on the phone after she got back from her cruise, but I just figured she was exaggerating. I mean someone mentions Hell you have to humour them right? So what do I know? My sister really did go to Hell and back while on her cruise a few weeks ago. 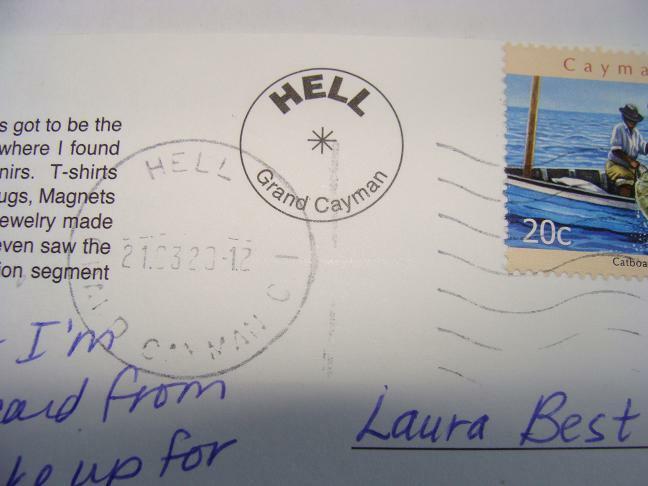 Apparently there is a place called Hell on the Cayman Islands. You might have heard of it. I think it’s quite a popular place—Hell yeah! Hell’s not all that big. I bet you’re surprised to learn that. There’s nothing in Hell but a post office inside a gift shop. (And I thought East Dalhousie was small!) Many of the tourists take their passports to get stamped while in Hell. Look at that, it only costs about 20 cents to send a postcard from Hell. I say let’s all go to Hell where the postal rates are affordable. I mean Canada Post has been bleeding me dry for years. I wonder how much it would cost to mail a full manuscript from Hell? And wouldn’t you love to be the editor to make the claim that she just received the manuscript from Hell? On second thought that’s probably happened more times than we could collectively count. The postcard my sister sent was to make up for the fact that she’d left Bitter, Sweet behind on the cruise ship that day. That’s right, my book nearly went to Hell and back. But a postcard is better than nothing so I’m not going to complain. Nice to know that when little sis made her historic visit to Hell and back that she was thinking of me—Um I guess.